It is well known that our area of the country has been facing cold temperatures! We have been inundated with phone calls from builders and homeowners who are dealing with frozen pipes. Frozen pipes are an inconvenience and can cause serious damage. When the temperature of a water pipe drops below freezing, water volume in the pipe can expand up to 10%. 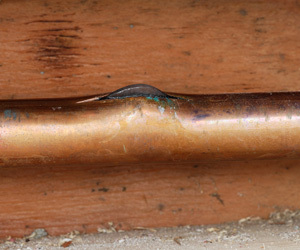 This causes increased pressure on water pipes and valves, and can cause pipes to burst. Add insulation to walls that are affected by water pipes. This can include the addition of dense packed fiberglass, spray foam or injection foam insulation to external walls. Cover exposed pipes in attics or crawl spaces. Foam insulation can protect water pipes from cold temperatures, and it is water resistant which makes it ideal for use on water pipes. Seal gaps around basement rim joists or seal your crawl space. This will assist in keeping cold air away from pipes. It will also help the main floor of your home retain an ambient temperature.